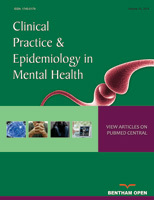 Clinical Practice & Epidemiology in Mental Health is an Open Access online journal, which publishes Research articles, Reviews, Letters etc. in the field of clinical practice and epidemiology in mental health, aiming to providing the most complete and reliable source of information on current developments in the field. Research articles should be of 4000-6000 words with 75 or more references excluding figures, structures, photographs, schemes, table, etc. This journal publishes open access reviews on recently published books (both print and electronic) relevant to the journal. Publishers and authors of books are invited to contact our book reviews editor at cpemh@benthamopen.net with book review requests. All submitted books will be reviewed by an independent expert in the field. No page charges will be levied to authors for the publication of book reviews. Brief reports of data from original research should have the total page length from two to three journal pages. Each journal page is on average 900 words. Short, focused and opinionated articles on any subject within the scope of the journal should have the total page length from three to five journal pages. Each journal page is on average 900 words. These articles are usually related to a contemporary issue, such as recent research findings, and are often written by opinion leaders invited by the Editorial Board. Reports of clinical cases that can be educational, describe a diagnostic or therapeutic dilemma, suggest an association, or present an important adverse reaction. All case report articles should be accompanied by written and signed consent to publish the information from the patients or their guardians. Case reports should have the total page length from one to three journal pages. Each journal page is on average 900 words. Presenting a new experimental method, test or procedure, Methodological articles should have the total maximum page length of seven journal pages. Each journal page is on average 900 words. The method described may either be completely new, or may offer a better version of an existing method. The article must describe a demonstrable advance on what is currently available. Presenting an argument that is not essentially based on practical research, Debate articles should have the total maximum page length of seven journal pages. Each journal page is on average 900 words. Debate articles can report on all aspects of the subject including sociological and ethical aspects. Short articles presenting an untested original Hypotheses backed solely by previously published results rather than any new evidence, should have the total maximum page length of seven journal pages. Each journal page is on average 900 words. They should outline significant progress in thinking that would also be testable. Describing proposed or ongoing research, providing a detailed account of the Hypotheses, rationale, and methodology of the study, Study protocol should have the total maximum page length of seven journal pages. Each journal page is on average 900 words. There is no restriction on the number of figures, tables or additional files e.g. video clips, animation and datasets, that can be included with each article online. Authors should include all relevant supporting data with each article. Murray G, Harvey A. Circadian rhythms and sleep in bipolar disorder. Bipolar Disord 2010; 12: 459-72. Ford HL, Sclafani RA, Degregori J. Cell cycle regulatory cascades. In: Stein GS, Pardee AB, Eds. Cell cycle and growth control: biomolecular regulation and cancer. 2nd ed. Hoboken (NJ): Wiley-Liss 2004; pp. 42-67. Anderson JC. Current status of chorion villus biopsy. In: Tudenhope D, Chenoweth J, Eds. Proceedings of the 4th Congress of the Australian Perinatal Society; 1986: Brisbane, Queensland: Australian Perinatal Society; 1987; pp. 190-6. Health on the Net Foundation. Health on the Net Foundation code of conduct (HONcode) for medical and health Web sites. Available at: http://www.hon.ch/HONcode/Conduct.html. Payne DK, Sullivan MD, Massie MJ. Women's psychological reactions to breast cancer. Semin Oncol 1996; 23 (1 Suppl 2): 89-97. Abend SM, Kulish N. The psychoanalytic method from an epistemological viewpoint. Int J Psychoanal 2002; 83 (Pt 2): 491-5. Ahrar K, Madoff DC, Gupta S, Wallace MJ, Price RE, Wright KC. Development of a large animal model for lung tumors. J Vasc Interv Radiol 2002; 13 (9 Pt 1): 923-8. All authors must strictly follow the guidelines below for preparing illustrations for publication in Clinical Practice & Epidemiology in Mental Health. If the figures are found to be sub-standard, then the manuscripts will be rejected. The open access publication fee details for each article published in the journal are given below. The fees are payable exclusively to Bentham OPEN. The fee structure for all other articles depends on the page length of the published articles. If the article is 9 pages and below the fee will be US$ 600; and from 10 pages to 30 pages US$ 800 and 31 pages and more , the publication fee will be US $900.